On a recent Saturday, teachers and elementary school students peeled off their coats and greeted each other with warm smiles deep in New Haven’s East Rock neighborhood. It stood in stark contrast to the scene outside, as a cold wind blew through the bare trees on the Foote School’s campus. Students and teachers weren’t there to make up lesson time that had been lost to the snow. Instead, they were participants in the Schools Together for Arts Resources (STARS) program, gathering together to fill the cold morning with new creations and collaborations. STARS has a history that’s over two decades in the making, and starts with Foote’s place as a small, independent school in one of the city’s wealthiest neighborhoods. In 1993, teachers at Foote were seeking opportunities to collaborate with colleagues at neighboring public schools. 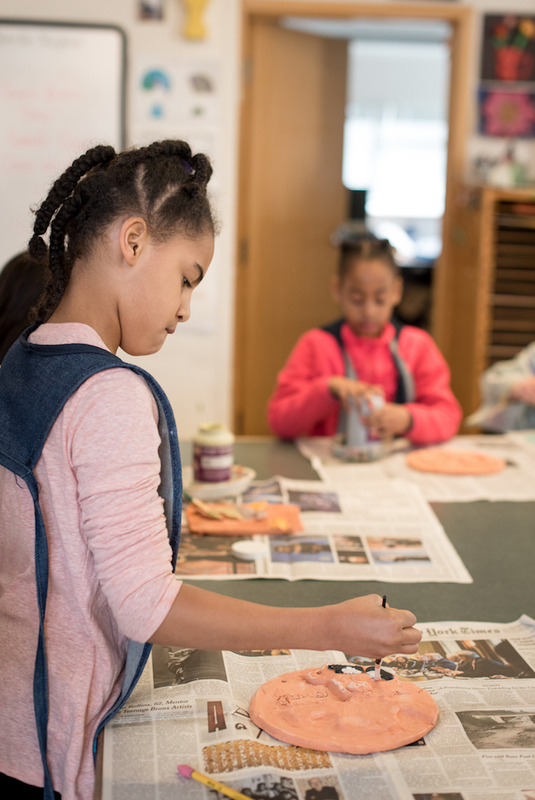 Funded by an anonymous donor, Foote faculty member Laura Altshul coordinated a theater and mask-making workshop with teachers and students from Lincoln-Basset School. After that first success, Altshul applied for grants. 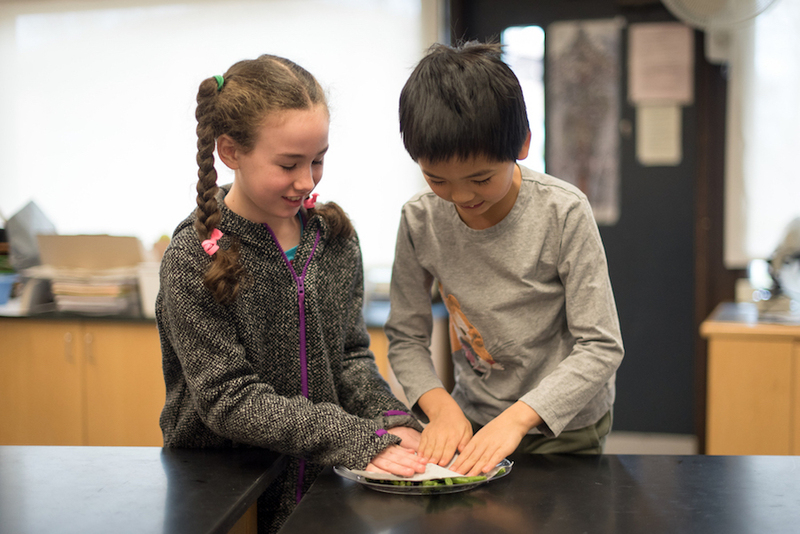 Instruction alternates each week between Foote School, Strong-21st Century Communications Magnet School and SCSU Laboratory, Celentano School, and other partnering schools. Co-teachers take the lead when in their own school. “Regardless of what space we’re in, the core of the program is there—teachers, students, learning,” said STARS director and Foote third-grade teacher Ashley Schnabel. That rang true as a quiet, wintery weekend morning unfolded in a flurry of activity. Sally Nunnally, a Spanish teacher at Foote and co-teacher of a STARS class called “Hello!/¡Hola!,” started a game of bilingual alphabet bingo with first and second graders, many of whom speak both Spanish and English. She paired them up, encouraging them to be open to working with anyone. When co-teacher Carlos Reyes-Couvertier, a first-grade bilingual teacher at Strong and SCSU Lab School, entered, a child spied the box of art supplies under his arm and whispered excitedly to a neighbor. 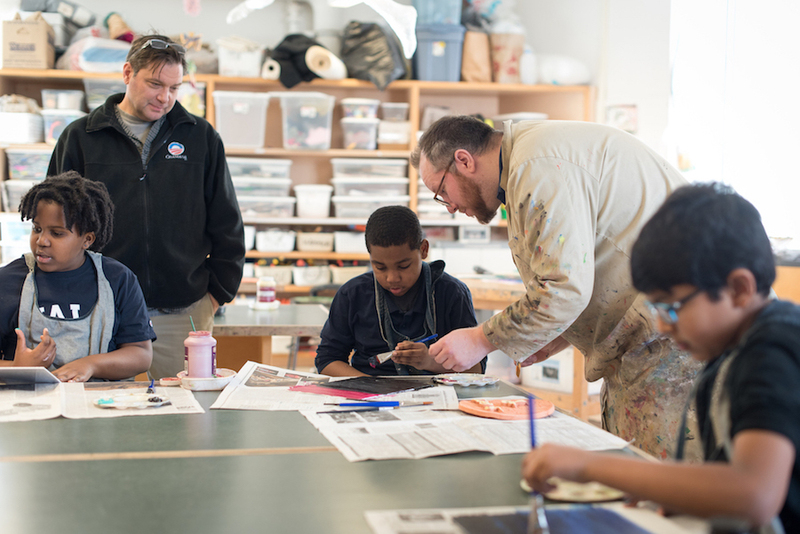 Up in the art room, Mike Golschneider, an art teacher at Foote, and John Sykes, a visual art teacher at Celentano, introduced the day’s theme: the Northern Lights. It’s a blending of science and art endemic to STARS: teachers blend varied subjects into irresistible, hands-on activities. “If I teach you how to do a blend, you’ll know how to do it for the rest of your life, and it’s a great art skill to have,” Golschneider said, blending paint for his sky as he spoke. His enthusiasm was infectious. As he flicked watered-down white paint onto the canvas with a toothbrush to make stars, students let out a collective, delighted exhale and inhale. He’s in the majority. Cheryl Luzzi, a first-grade teacher at Celentano, said she joined STARS to help merge communities within New Haven. She said she wants her students to be exposed to new experiences—and is using the arts to get there. In Luzzi and Coleman’s “Cooking Around the World,” students develop valuable cooking skills and get the chance to try new foods by making recipes and craft projects inspired by various countries. This year, they’ve already “visited” Morocco, Mexico, and Japan. Senegal is coming up. To help students understand that Africa is a diverse continent, “we purposefully chose two countries from Africa that are really different,” both teachers said. A vivacious bunch of kindergarteners and first graders surrounded two tables, flour up to their elbows. Later, their hands clean and the dough left to rise, students settled in as Banta read Bread and Jam for Frances by Russell and Lillian Hoban. Meanwhile, the “Hello!/¡Hola!” group snacked around the table, chatting easily in Spanish and English. Then they dug in to those much-anticipated art supplies, making animal puppets inspired by the vibrant illustrations in Cuckoo/Cucú by Lois Ehlert. “The kids, as well as their parents, are curious, excited, engaged and appreciative,” said Luzzi. “They’re flourishing,” beamed Schnabel. Everywhere the children are in a state of flow: quiet, content, and engrossed in satisfying work. Teachers circulate with tips and encouragement: wellsprings for these eager young artists. Back in the art room, one girl is ready to add Northern Lights to her sky. She took up a pastel, Golschneider watching each move. On the page, a constellation of sorts was forming. There was one blooming in the school, too—a marriage of art, literature, language and cuisine that lit up tens of young minds. A whole arts galaxy, ready to be explored. 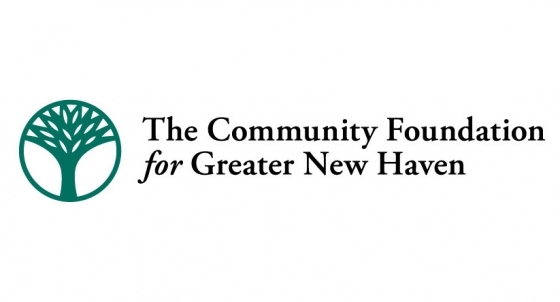 “The arts community in New Haven is so diverse,” said Sykes. “Getting students started young and letting them know what’s out there is so important."